Do The Duggars Promote The Pearls' Teachings? | Why Not Train A Child? You are here: Home / The Pearls' Teachings / Links about the Pearls / Do The Duggars Promote The Pearls’ Teachings? Do The Duggars Promote The Pearls’ Teachings? I was recently told that it is unfair of us to group the lovely Duggar Family with the likes of the Pearls and the Quiverfull Movement. I always try to be fair so I have done some research. On this page you will find Proof that the Duggars Promote the Pearls’ Teachings. You can use CTRL F to find “nogreaterjoy” or you can scroll down past the highlighted yellow box, into the white area to find the link to the Pearls’ website, No Greater Joy, and the Duggars’ endorsement. On that same page they also link to the businesses of the Pearls’ adult children, The Bulk Herb Store, Cane Creek Coffee and a book by Shoshanna Easling. While it’s true that in their 2012 book, “A Love that Multiplies ” the Dugars deny being a part of the Quiverfull Movement, they embrace the same ideals and appear to be friendly with those in the movement, especially with Gothard and ATI. Here is a list of blogs and articles which back this up. So, while they appear to be “guilty by association,” I can see why many want to give them the benefit of the doubt. That is all fine and good, but I cannot help but be very leery of anyone who promotes No Greater Joy as, “some of the finest in family-friendly, value-based books, audios, videos, and articles on parenting, husband and wife relationships, ministry and more!” but maybe that’s just me. Edited to add: It has just come to my attention that the person who handles the Duggar Book promotions, Mel Cohen, is the same person who handles the book promotions for the Pearls. This explains a lot and leaves it up in the air as to whether or not the Duggars actually promote the Pearls teachings. I still believe that they should be held accountable for what is published under their name. They must be aware by now that their name is being linked to the Pearls because of this promotion and can have it changed at any time, but they have not. If anyone feels that they are not aware of this situation, please contact them and make them aware. I have also heard that they practice gentle parenting. If I am not mistaken, as members of ATI, they are required to use corporal punishment. Also, here is an old article which states that they believe that the Bible requires spanking. Now, in an article from 2010, someone came right out and asked her if she ever spanked her children and look at her response. As you can clearly see, she said no. Wait… No, not exactly… Well, she sure didn’t say yes… The truth is, she use over 700 words to say that they focus on the positive while evading the question entirely. Edited to add March 13, 2015: I noticed that some of the pages to which I was linking in this post have been removed from the Dugger’s website so I am now linking to them on the Internet Archive (Way Back Machine) to prove that they used to exist. 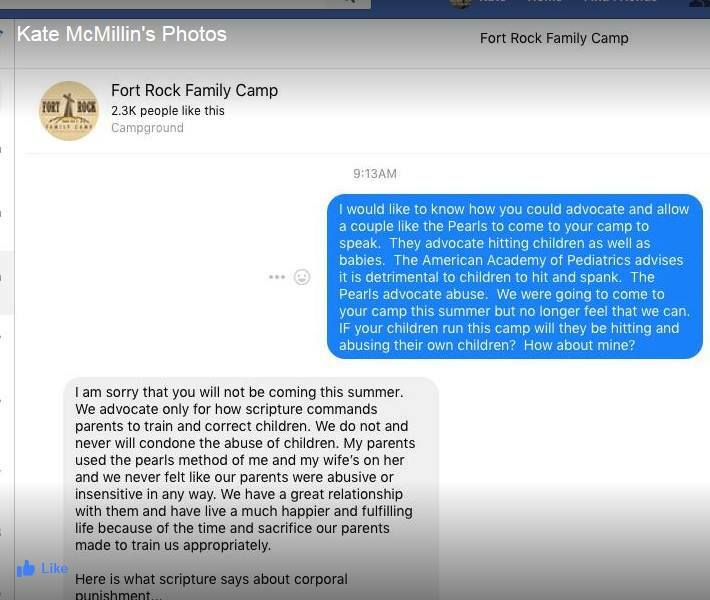 Edited May 23, 2016 to add a new link: Duggar Endorsed Ministry: Depravity Spreading From One Christian Homeschool Family To The Next. Here is proof from the Duggar’s Facebook page. Edited Sept 14, 2018 to add this new article from Celebrity Insider, Duggar Family Accused Of Child Abuse By ‘Counting On’ Fans. In their book, ’20 and Counting,’ the Duggars have ATI listed in the Resources section in the back. So maybe they don’t embrace the name Quiverfull, but as you said, they are definitely associated with the movement and promote the lifestyle. I can’t find the question you were taling about. The blog is some blog written by the Duggars fans, did you mean to link to their actual site? The link I gave pointed right to the question, but since it is not an official Duggar blog, I have removed it. I apologize for my carelessness. If you go to the Duggar family website ATI and Vision Forum are still promoted by the Duggar family and have been for several years. Thank you. Yes, there is no doubt that they promote ATI. However, some are still convinced that they use ATI just for the homeschooling while still parenting gently. By the way, is that their official blog or not? I just removed a link to it because I was informed that it was just a fan site. I did not realize the Duggars do not officially run that website. I did want to establish the Duggars Vision Forum connection. In July of 2010 Vision Forum held a conference in San Antonio Texas called the Baby Conference. Jim Bob and Michelle Duggar both spoke at the event and Michelle received a mother of the year award during the conference directly from Vision Forum. Part of the conference was an event called Tea with Michelle which was a speech combined with a question and answer period of Mrs. Duggar. I think this is pretty strong evidence of how they feel about Vision Forum. 2) Do they follow and/or promote the Pearls’ Teachings? You do know that isn’t the *Duggars’* blog, right?? That blog is owned and operated by a mother-daughter team that are fans of the Duggars. They have spoken to the Duggars, and have interviewed them, but the Duggars do not have a ‘blog’, except for the articles Michelle writes at the TLC ‘Parentables’ site. I thought her post on spanking was great. She very nicely said 1) Our discipline is between us and our children, and 2) focused on the positive. Thank you, I have removed the link. Her post on spanking was nicely worded and did not answer the question. While it is true that it is none of our business if they spank or not, I feel that it is safe to assume that they do spank because they declare that spanking is Biblical and are very involved with ATI. Remember, the reason I am doing this research is that in a recent post, I linked to a post about the Newsboys and their connections to the Quiverfull Movement. The Duggars were mentioned in that post. Someone complained to me that the Duggars should not be linked to the Pearls at all and informed me that they were very gentle and do not spank. My research has lead me to the conclusion that they do spank, are very involved with ATI and do not object to their publicist promoting the Pearls’ teachings under their name. In my research on the web, it is interesting that I am finding more blogs like this one popping up that are critical (in a nice way) over Gothard, the Duggars, Quiverfull, etc. So, in speaking my mind, it is the Duggar’s business how many children they want to have as long as they take care of them. They are blessed to have a TV show that helps pay the bills. But this is certainly not God’s plan for every Christian family. Unfortunately, legalism rears its ugly head (and that head has 2 horns) in that have large families is God’s master plan and He is only pleased if you follow that plan. Too many people have swallowed that pill about not using birth control then live in squalor and want when they find out they cannot pay the bills on only the father working. I have struggled with the legalism of gothard, quiverfull and other seemingly “this is what God said to do” ministries and groups. I never wanted nor had children. Was I wrong? So I decided to do a little research on the subject of christian families and this is what I found. For centuries large families were the norm for christians and non-christians alike since large families offered more help in subsistence living to tend fields and animals. Birth control was either unheard of or not readily available. Back in the mid 20th century, many dedicated American missionaries chose to have only one or a few children and often left them behind for others to raise as they went into sometimes dangerous mission fields. That was considered a truly high calling to give up your children to follow God into the mission field. When did that stop becoming God’s way? How did those missionaries, truly intent on following the will of God, miss out on quiverful teachings? A famous preacher called Peter Marshall (the movie A Man Called Peter is truly inspirational!) had only one son. How did such a holy man of God miss preaching quiverfull instead choosing to preach following God through a relationship with Jesus Christ? Andrea and Rusty chose to obey quiverfull teachings instead of the doctor who told her to stop having kids until the hormones and other problems from having kids so close together could heal. Now her children are dead, she is in prison for life, her husband divorced and remarried with a new baby. If QF promises that God will provide for all those babies He gives a family, why did He not provide sanity and instant healing for the Yates and protection for their children? Perhaps the answer to all those samples above is God does not make cookie cutter christians. God has a different plan for every one. It is a mistake to try to follow God’s plan for others. There was only one Moses who led the Israelites out of Egypt and witnessed the one and only parting of the Red Sea, only one Noah who rode out the flood with all the animals on the one and only ark, only one Abraham who by faith believed God’s promise to make him a nation (Sarah had his one son of promise) one David who using only one stone, brought down a giant. And one Mary who was visited by the one Holy Spirit to become mother of the one and only Jesus who proclaims that he is the only One by whom salvation can be had. None of them attended any Gothard seminars or heard a Billy Graham speak and quiverfull was their only way of life because there was no birth-control. Nor were there cars nor electric lights back then but we use them now without feeling sinful. And God has made only one YOU and one ME…an incredible distinct personality found lost and wandering that He will paint and frame into one masterpiece! And that masterpiece will look like no other. Thank you for your thoughts. To clarify, I have no problem with people having as many children as God gives them. My concern to refute the abusive teachings which many espouse as Biblical.